Thanks to all for the good turnout at last night’s practice. We had 7 ringers: Anne, Carol, George, Jody, Ken, myself and Jonathan Penn, a guest ringer from Suffolk visiting with his wife Julia. I think they enjoyed the practice and the pancakes thereafter in the Cathedral Hall. Good job, too, on the plain hunting and tenoring behind! In honor of the 70th birthday of Michael Tilson Thomas (MTT), the co-founder and artistic director of the New World Symphony, America’s Orchestral Academy, and with 85th birthday compliment to R. Roger Savory. First in method: 4, 6, 8. 832 Rutland, 768 Pudsey, 640 Superlative, 576 each Bristol, Cambridge, Lincolnshire, and London, and 512 Yorkshire. 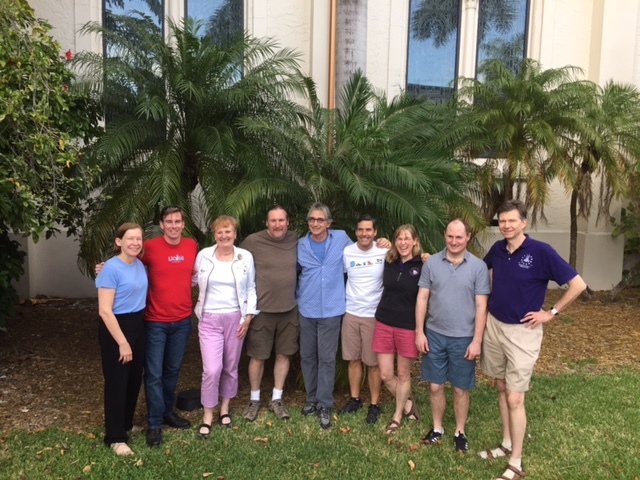 Ringing this weekend was extraordinary, and I was extremely proud to be associated with the Miami Guild of Change Ringers. The visiting ringers told me over and over what great hosts we were, how much they enjoyed their time with us, and how much progress they saw in our ringing since their last visit here almost two years ago. Thomas will be very proud when I update him on what has become of the seeds he planted in Miami. The weekend events were very well attended, including Friday night practice, Sunday service ringing, and the social events on Friday and Saturday night. We missed Anne who had commitments which prevented her from joining us, and Pamela who was with us in spirit from England, but everyone else (including Dean McCaleb and Kemp) participated at one level or another, and many hands made light work. Locals and visitors alike loved the food everyone prepared Friday night and the incomparable setting and hospitality at Chas and Bobbie’s home, and all the contributions and good cheer from the Miami Guild made the Saturday night event at my home quite festive (and relatively effortless for me). And thanks to Marg for ensuring the ringers were fed lunch before Sunday’s peal. Yes, it was a peal—not a peal attempt! Both peal attempts were successful. It was a thrill for me since the peals were in the tower where I first learned to ring (thanks to Marg, Judy, Jim, Andrew). The details of the peals and dedications can be found at the following links: http://www.bb.ringingworld.co.uk/view.php?id=369069 and http://www.bb.ringingworld.co.uk/view.php?id=369066. Sunday’s peal was dedicated to Michael Tilson Thomas on the occasion of his 70th birthday. He and his entourage came up into the tower to meet the peal ringers, learn more about change ringing, and watch/listen while Alex called a touch of Grandsire Triples. They listened outside for a while and returned to listen to the end of the peal. They greeted the band as we exited the tower and congratulated us all. Victoria Rogers (Trinity’s junior warden, Executive VP of the New World Symphony, and our promotor behind the scenes) e-mailed me this morning that a donation is coming to Trinity as a result! Visitors were: Alex Taft (Washington Ringing Society, or “WRS”, which rings at the National Cathedral and Old Post Office Tower); Sue O’Neill (WRS); Cecily Rock (WRS) and her husband Joe Nega; Beth Sinclair (WRS) and her husband Mark Morgan; Rob Gibson (WRS); Tim Barnes (Trinity Wall Street in NYC); and Maurice Southworth and his wife Liz (Boston).